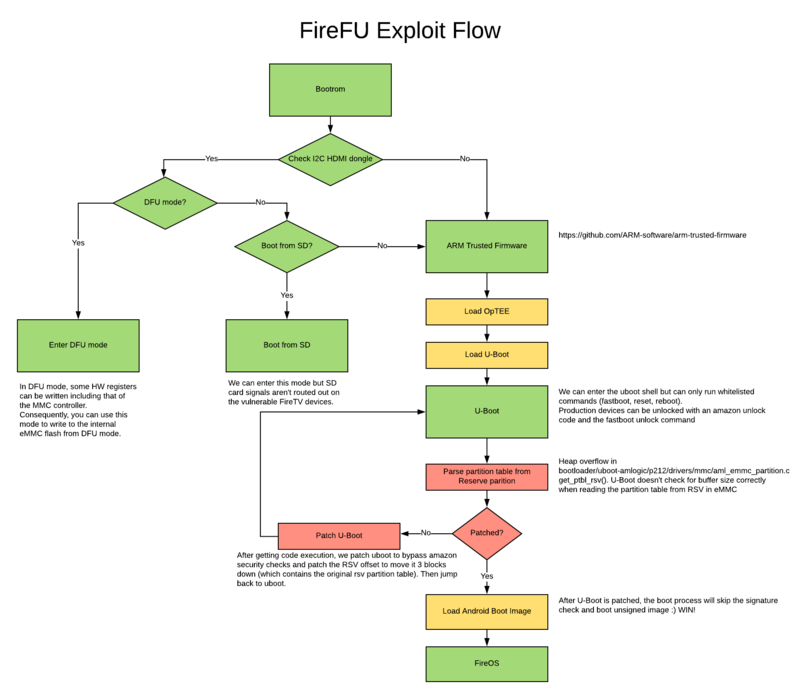 FireFU is an exploit chain leveraging a read write primitive from the FireTV Cube and Pendant’s Amlogic S905Z microcontroller along with a heap overflow within the parsing of the devices RSV partition table allowing for the running of unsigned code. This is all done through the exploit's install script but is documented here for the curious. 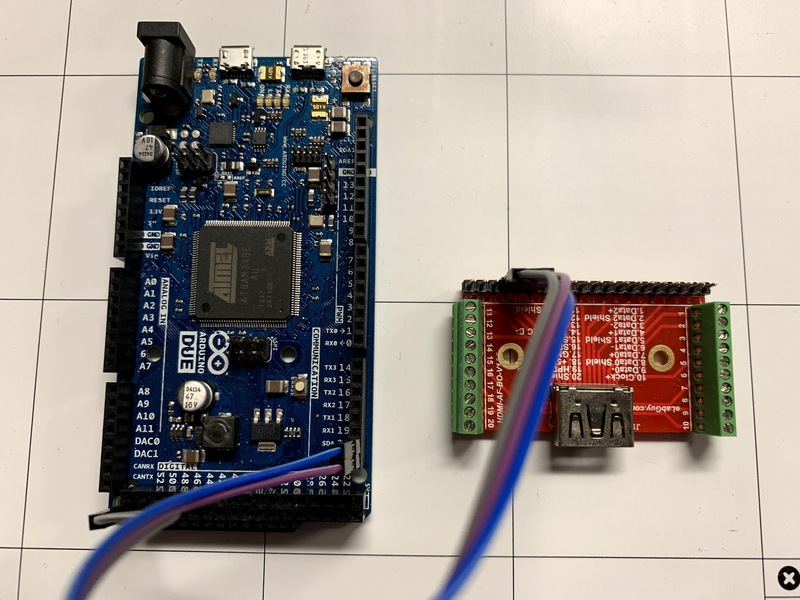 We enter DFU mode by connecting to the devices HDMI port and passing “[email protected]” to the Amlogic S905Z through the HDMI’s i2c interface. In DFU mode, we are able to read and write memory. we leverage the read/write primitive to write to hardware registers for the MMC controller. After entering DFU, we write to the emmc controller to modify the devices flash. We copy the original RSV table to a new locations 3 blocks away. Because we exploit u-boot early on in the boot chain and we do it every boot, we are able to modify u-boot in ram breaking the secure boot “chain of trust” and allowing for unsigned code to be ran. a new recovery to fix issues with the Fire Tv recovery accessing the old RSV location. We then reboot to complete the root process. While this process can be done in a virtual machine, a lot of data is backed up and flashed during this process and a VM environment will drastically slow down communication in DFU mode. Arduino, Teensy or any Arduino compatible dev board that provides an I2C bus. This process has only been tested with the Arduino Due and Teensy 3. Other boards are untested! Hook up the Arduino to your PC and flash the hdmi_arduino.ino sketch in the hdmi_dongle/hdmi_arduino folder. look for something similar to this: ID 1b8e:c003 Amlogic, Inc. Remember to keep your backup safe! Any update can remove the code signing update or possibly brick the device. We recommend disabling OTA updates with the following. You can also block update DNS domain at your router or install a custom recovery to be safe. After each amazon supplied new image or OTA update, you must patch the boot and recovery images again (because of FireFu's RSV relocation). Below is the download information for the exploit. This download is intended for users who are only seeking the binaries to perform the exploit. This is for the users who are needing to recompile the exploit or are just curious about the process. This page was last edited on 14 November 2018, at 07:50.